Vice President Yemi Osinbajo revealed that his monthly pay alongside the president is low. Speaking at the end-of-year seminar of the State House Press Corps at the old Banquet Hall of the Presidential Villa in Abuja, Prof. Osinbajo first criticized the private sector for disrespecting the national minimum wage law, which has the lowest pay at N18,000. 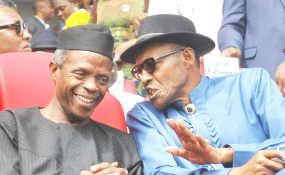 Osinbajo further revealed that his annual earning is N1.5m as Vice-President; President Buhari earns about N1.75 million, adding that the pay is quite low to the kind of offices they occupy. I realised first of all that this (journalism) is not a profession from which one could make a decent living in the first place unless you find a really good way of doing so. But more importantly for me is that you are just on your own. Journalism as a profession is so wide open. There are a few reasons in my view why remuneration is poor. The first is that it is just simply cheating. There are owners of media that are just cheats. They just want to get something from nothing and that is not uncommon, it is a general malaise, it is not necessarily restricted to the media. It is also the same in the legal profession. There many lawyers if they tell you what they earn, you will certainly not want to be a lawyer.”The private sector does not respect the minimum wage. Even if a minimum wage is set nationally, it is not necessarily respected by the private sector and this is something that should be factored in to the status of a company and whether a company is even complying with the requirements. Osinbajo further encouraged journalists to seek for a better future by improving themselves and getting better job opportunities with attendant improved income.